I had been sent to Da Nang for psychological warfare training. I was not interested in the training and remember little of it, though I did make some art work—I drew the face of a tiger for a propaganda leaflet to be air-dropped on the Vietnamese. Supposedly the Vietnamese feared the tiger, a symbol of a stalker that is always present. I was housed in a hotel. It seemed very quaint; the architecture was French, small and old. It was near the time of the Tet holiday, when there was usually an offensive by the North Vietnamese. There were sandbags, concertina wire, and a machine gun on the roof, just above the entrance. I was amazed at how comfortable we were there. For months I had been sleeping on the ground or in a hole I dug, and now I had a real bed in a building. The soldiers there even had music. I first saw Lan at a ferry crossing on the Mekong River, playing with some other children. She was a beautiful child, with large, alert eyes that looked directly at me. I had been in Vietnam for six months but had had no opportunity to talk with people. Here was a young girl who spoke English, so I tried to speak with her. An MP appeared and chased the children away. He said that sometimes children were used to carry hand grenades because they could get close to the GIs. One evening, a couple of days later, I was sitting in my room when a soldier stuck his head in the door and said, "Someone is at the front door asking for you." I was confused and thought it was a mistake. How could someone possibly know me here? When I got downstairs, I saw Lan. Later, I discovered that her family lived not far away and she knew all of the GIs stationed at the hotel. I remember how she stood on the curb while I stood in the gutter, She straightened my uniform and asked me to come meet her father. She took my hand and pulled me into a run saying, "We hurry, don't let MPs see us." She led me through the streets and down a narrow walkway among closely crowded houses to her home, where she introduced me to her father and baby brother. We sat at an old wooden table and talked. She asked me for a phtograph of myself. I gave her the only one I had: an old high-school graduation picture in my billfold. She pulled out a worn cigar box and gently placed it inside. The box was filled to the top with pictures of other GIs. The memory of that box of pictures has remained with me to this day, a photograph in my mind. I never saw her again. Days later I was back in the bush. 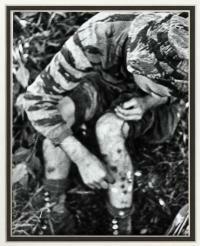 Jungle Rot: In the jungle our cuts and scratches became infected and turned into painfull sores. We called these jungle rot. At one time, when I was point man with the LRRPs, I had bandages on both arms from wrist to elbow and both legs from ankle to knee.